A high-quality UTP cable (twisted pair, wire) with 4 pairs. It is certified as cat. 6 for GB networks. 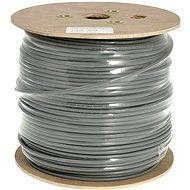 The whole pack includes 305m of the cable. Note: The cable is not designed for crimping connectors. It is designed for mains sockets only. 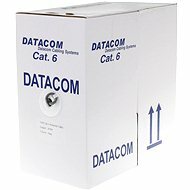 For shipping to other EU countries visit this page Datacom, wire, CAT6, UTP, 305m/box. 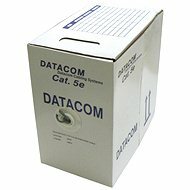 Für Versand nach Deutschland, besuchen Sie bitte Datacom, Kabel, CAT6, UTP, 305m/box. Chcete doručit zboží do Česka? 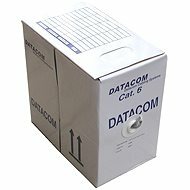 Prohlédněte si Datacom drát, CAT6, UTP, 305m/box. Chcete doručiť tovar na Slovensko? Prezrite si Datacom, drôt, CAT6, UTP, 305 m/box. Für Versand nach Österreich, besuchen Sie bitte Datacom, Kabel, CAT6, UTP, 305m/box. Magyarországra történő kiszállításért tekintse meg ezt a termékoldalt: Datacom, drót, CAT6, UTP, 305 m / box.